Being an undeniable Sweaty Betty, I like to keep my summer clothes cool and casual because nobody can pull off the SULA (sweaty upper lip alert, if you were wondering). No matter what the season is, my wardrobe mainly consists of plain clothes so if I want to make things a bit fancy I reach for a statement necklace. A bold necklace can really set off a simple outfit so I hoard them like nobody’s business. Here are a few of my favourites I have collected over the years, worn here with just a plain vest for demonstration purposes (and it’s a hot day – Sweaty Betty alert). Whilst on a work experience placement at Closer magazine, a fellow intern was wearing this necklace and I love it. I expected it to be pricey but guess what – an absolute barg at the one and only Primark for £3!! Awwwww yeaaaaah. This was a birthday gift last year from my wonderful housemate and it’s soooo pretty. I love the intricate bead detailing and it transforms a lazy tshirt and jeans day. Accessorize know how to do accessories (funny, that). A bit more regal than what I’d usually go for but I love the detailing to this Dorothy Perkins piece. Although fairly fancy in its design, the black rope makes it more casual so it has versatile wear. Almost makes me feel like Kate Middleton… Almost. I love wearing this Topshop chain with clothes that come high in the neck, especially black pieces on a night out. The pastel pink stones are so pretty and it’s different to anything else. Believe it or not, I bought this necklace for a Halloween sixth form party which I decided to go to in a toga (I hate to be that girl, strictly ugly costumes these days though don’t worry). Another bargain Primarni number, I still love this thrown on with a plain tshirt and jeans. 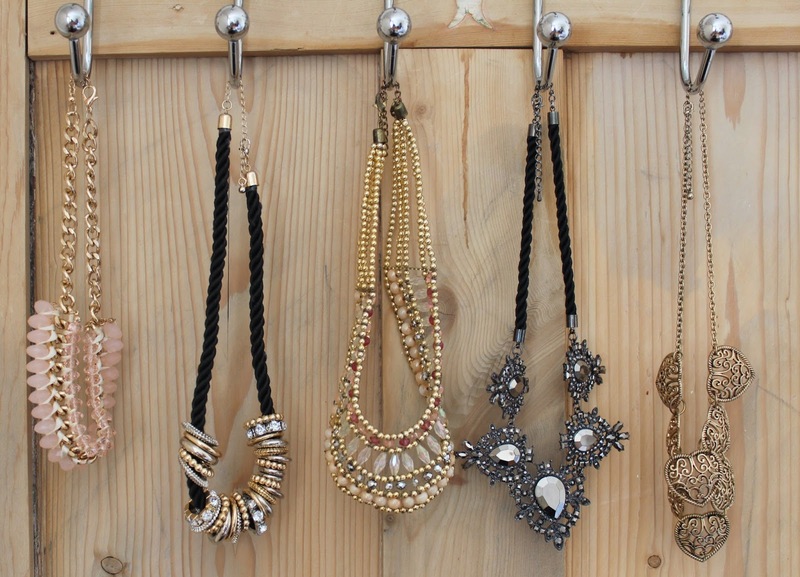 Where do you like to shop for statement necklaces?